Snoqualmie, WA (October 18, 2016) -Hyperlite Wakeboards is excited to announce the launch of our #iRideHyperlite community on Hyperlite.com. Many of you have seen us use #iRideHyperlite over the past two seasons, and we appreciate all our fans that have jumped on board. Now, we have a home for you on Hyperlite.com. So we invite you to load your profile and become part of our riding crew. Your #iRideHyperlite profile gives you the opportunity to upload your photos and a video link. You can also share your favorite Wakeboarding stories, highlight your favorite rider and more. Your unique profile will live on our website and you can share it with all of your Wakeboard friends and family. Our #iRideHyperlite map will show you how many riders there are in your city along with the boards and bindings they ride. Throughout the season we will share your profiles on our Facebook and Instagram channels and award prizes; from Free Wakeboards to Bindings and Apparel. Join the movement! 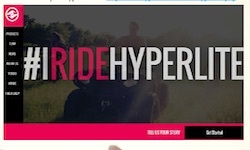 Get featured alongside Rusty Malinoski, Shaun Murray & JD Webb by creating your profile on Hyperlite.com today, then share it with all your friends!